All three of these phones are in Perth, Western Australia, are on the Telstra network and are set to automatically update their time from the network. 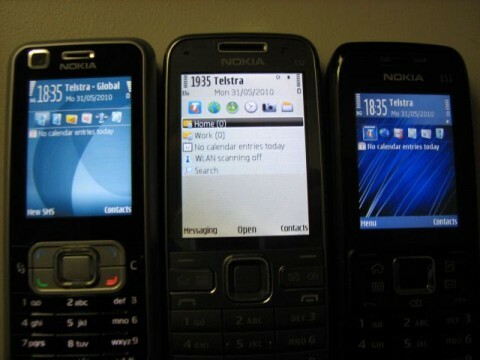 The brand-new Nokia E52 in the middle is an hour ahead. How do you fix it? First, you need to switch off the pesky automatic time sync and pick a useful time zone. You will then need to set the Time manually. Can my phone auto-update its time some other way? By itself the phone will keep its time reasonably accurate (within a minute or two) for weeks, if not months. What if you use your phone as an alarm clock (as I do) and don’t want to have to keep manually updating the time? To solve this problem I hunted around and found an awesome Symbian app called FreeTimeBox that can auto-update the time from a variety of sources – even the phone’s GPS – automatically. Download it here. Once you load FreeTimeBox from the Applications menu, select settings. Make sure Start on boot is set to Enabled. In the syc settings, set it to do a scheduled sync and set the Access point for NTP (I use Telstra.Internet). For the Time server, first, add a new server. I use my own server of 203.59.7.248 on port 123 but any NTP server will work. Select Sync now (NTP) and your phone should correct its clock. Ultimately, it’s up to Nokia and Telstra to fix this. How were these new phones (The Nokia 6720 classic is affected too) were released with such obvious firmware bugs..? The latest firmware update for the E52 and 6720 classic fixes the problem. Yay! Optus 6720 classics are still affected as Optus hasn’t released the firmware update as yet. I have a E52 with firmware version 034.001 which according to Nokia Ovi Suite is the latest version. But time in WA is still incorrectly set one hour advanced if automatic network update is selected. Which firmware version do you have? The firmware update mentioned in your last post – was that from Nokia or Telstra? Hope to get this frustrating issue sorted! I quite often travel interstate. My E52 is running the latest firmware also and it looks like the bug with automatic time sync is back. My phone automatically downloaded a patch a few months ago that fixed the problem but now the problem is back and I have no idea how it happened! The biggest problem with Nokia phones is that they rely on the carriers to release firmware updates – Nokia will continuously update the firmware for their phones but until the carrier approves each update and actually releases it we’re stuck. Looks like I’ll have to try the FreeTimeBox solution. But does that recognise if you have travelled to a different time zone? Telstra have released firmware 054.003 for the E52 – which finally, FINALLY fixes the Perth timezone bug.